Morning, noon and night, the world’s on. The players who want to be seen are on. 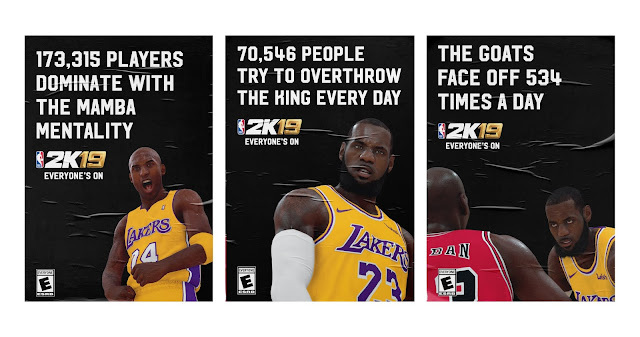 NBA 2K19, supported by creative agency, BSSP, launched today their newest campaign – Everyone’s On. As the gaming world evolves, 2K Sports is leveraging actual in-game data to showcase the magnitude of gameplay statistics and share the most impressive trends and results from users playing the game. The campaign consists of OOH, digital banners, video, and social, and showcases highlights such as the number of 3’s scored, or how many times Jordan beat LeBron each day. The Bulls have 135,345 new G.O.A.T.S. Within the campaign’s digital OOH elements, numbers will regularly update to match the most current in-game figures, including at an LA Live takeover at Staples Center for fans of the game to enjoy while actually at a game. This effort follows on from BSSP’s “They Will Know Your Name” campaign, which launched in June this year – know you’ve covered previous installations of the campaign. In addition to “Everyone’s On,” BSSP is assisting NBA 2K in the launch of the latest NBA 2K Mobile App -- a free mobile experience that will rival consoles for the first time. This platform will allow fans to bring the graphics, features, strategy and skills of their console game with them, everywhere, anytime, all the time.